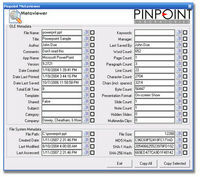 Date Cracker 2000 is a program which removes the date protection from programs which expire after a specific date. It is most useful for shareware or trial versions of software. Note that this program should be used for educational purposes only. Another interesting software developed allows you to remove passwords from MS Access '95 or '97 MDB files. Software like Date Cracker 2000 helps two kinds of people. Software Users........... Software Developers... Software Users are benefitted by a great extent because they can use a shareware or trial version of a software indefinitely. This means that most software which expire after a certain date can be used well after that date (almost indefinitely). The key is to run the software via Date Cracker 2000 when you get a demo / trial version of any software. Software Developers should be aware of such programs (trust me, they are!). They must devise better algorithms so that their software will be protected better. But the fact is, most software developers do not mind their software (Trial versions/ Demo's) being run by such programs....while some developers cannot do anything about their software after releasing it. But they can ensure that later versions of their software should have better date protection. 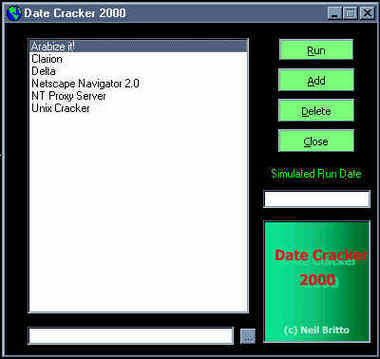 Of couse, there will be always be a newer version of Date Cracker 2000.